In this interview, Rebecca Fisher discusses some of the main ideas in her wonderful essay 'The Paradox of Democratic Capitalism: An Historical View'. 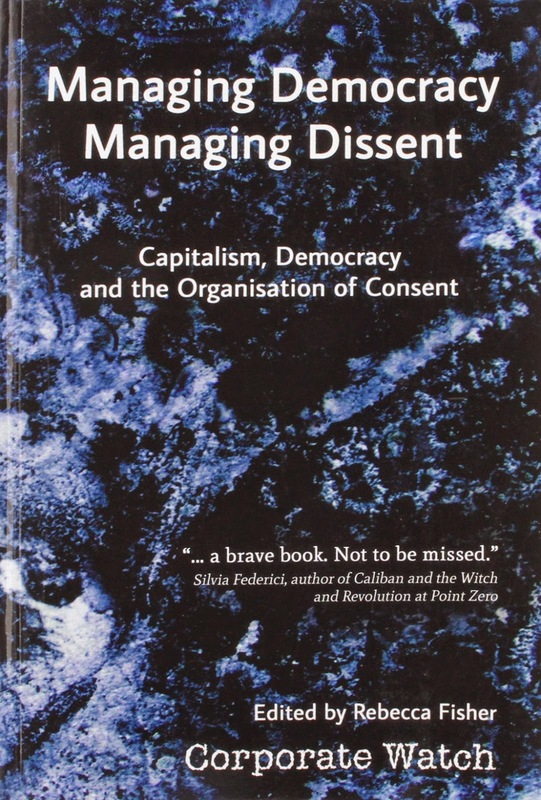 The essay was printed in the must-read Corporate Watch book 'Managing Democracy, Managing Dissent: Capitalism, Democracy and the Organisation of Consent' (2013, edited by Rebecca Fisher), which can be downloaded for free from here, or bought for the bargain price of £10 here. A free PDF of this interview is available to download from here. (1) What kind of a democracy exists in most advanced capitalist countries today? Is this kind of democracy genuinely democratic? The kind of democracy that exists in the most advanced capitalist countries doesn't really constitute a democracy, in the original sense of the word. It certainly doesn't allow for public participation in decision-making, since this might threaten corporate, capitalist interests. Instead, it allows a very limited degree of public participation, since most people are permitted to vote. Various structures and processes are in place to ensure that this is extremely ineffectual in terms of influencing what actually happens. Firstly, we only get to vote once every 4 to 5 years nationally. Secondly, the choices put to us are severely limited – all the available political parties are pretty homogeneous - no political party is likely to get the funding or the establishment support if they presented a radically different alternative. Thirdly, important decisions, structural decisions, are made by corporations, institutions and elites in the interests of capital, often tightly insulated from 'political' interference. And since these businesses exert such power, they also tend to exert power over politicians, almost always with more success than the public can. Fourthly, the information about how the world operates, and what decisions are made, by whom and for whom, is strictly policed, via means of corporate and state manipulation and control of the media, and other knowledge producing systems. This means that certain myths and disinformations can exert remarkable power over public opinion; and opinions that run counter to the mainstream are portrayed as 'illegitimate'. The result is a 'democracy' in which the major decisions affecting the vast majority of the world's populations are made by a very small elite of individuals and transnational corporations, who prioritise the demands of capital accumulation above any human or environmental concerns. The main services provided by the so-called 'democratically' elected governments are therefore to create and maintain the conditions necessary for this continued economic expansion. (2) Are capitalism and democracy compatible? No – this is the crux of the issue. Genuine, participatory democracy and capitalism have entirely contradictory requirements and demands. Capitalism requires constant expansion – i.e. perpetual economic growth – which is reliant upon the exploitation of labour – both paid and unpaid. It thus demands both coercion (to make people work in conditions which enable profit making) and inequality (as wealth and power concentrates in the hands of a few). Whereas genuine, participatory democracy requires both universal freedom to participate in decision-making, and therefore socio-economic equality: for if everyone is free then everyone must also be equal since no-one will have power over them. This goes to show how it is impossible to separate political power from economic and social power. This false division has lead to the current distortion of democracy to mean only limited political freedoms existing within a deeply and inherently unequal society. This is liberal 'democracy' – which is considered democratic as long as procedural aspects – primarily voting – are followed, even in the absence of broader social and economic equality or freedoms. This then is the paradox of democratic capitalism – capitalism cannot afford to guarantee democracy because it can't co-exist with the socio-economic equality that genuine democracy would entail, but yet today capitalism is commonly deemed to be democratic, despite the rigid limits placed upon this 'democracy'. (3) When did you first become aware of the paradox of democratic capitalism? I can't really remember when I was first made aware of it – but what really brought it home was my disillusionment with mainstream NGOs, for whom I worked briefly upon graduating. There I very quickly became disheartenend by the limits to their lobbying and despite their often very sound analysis of particular issues. These limits seemed to stem from the lip-service paid to them by the government – for example inviting NGOs to lobby them on particular issues, or in organising safe, AtoB demonstrations. Liberal governments are always keen to appear 'democratic' in these ways, yet they can rarely afford to accede to these demands, at least not the really substantial ones, since their loyalties are to transnational capital. I found then that NGOs tended to limit their demands according to what they felt was 'achievable', i.e. to what they felt the government might relent on, particularly since they were competing for public support, which they felt depended on such 'successes'. So the limitations of the NGOs' demands seemed to me to stem from the process of engagement with governments – from the unwritten but firm rules on what is permissible to advocate for, while still retaining their place at the table. The interesting thing was that this 'place at the table' often then translated as credibility or legitimacy. Thus, within some circles – I don't mean all NGOs by any means – to speak of more radical politics might raise a snicker, or even a guffaw, since they were deemed so beyond the unspoken pale. This notion of the limits of credibility seemed to me to be crucial – and also very difficult to explain or find the cause of, since the limits were unspoken yet widely understood. In short, it seemed to me very odd, not to say disappointing, that despite their patent and obvious difficulty in effecting any of the changes they were lobbying for, that this didn't lead them to question the entire system. (4) How is public consent for democratic capitalism organised? What happens when this consent is absent? This is a very complicated and multi-faceted process. It occurs throughout and across a wide range of arenas, and using various means. In the book they are divided into three main categories: control of information, co-option and repression. Control of information includes processes such as propaganda, language, the state/corporate media systems and entertainment industries. But we also could have included academia, education, the public relations industry, advertising, culture more generally, the family and many others. The overriding point here is the sources we have at our disposal to learn about how the world functions, even how we humans function, how we understand ourselves even, is influenced, and sometimes even moulded, in ways which engender general public acceptance of the basic tenets of capitalism – and in this case, teaches us that capitalism is democratic and therefore, if you have any problem with it, which you surely will, it is amenable to change. Even when the facts on the ground evidently show that capitalism creates and depends upon those problems. This is obviously a staggeringly difficult task – no wonder then that so much energy is invested in masking the incompatibility of democracy and capitalism. But it is a task which is never and can never be wholly successful. People will always resist, and posit their own interpretations and actions for change. The wool can never be pulled completely over all of the people, all of the time. When people do resist though, there are various means which help to ensure that such initiatives do not threaten the entire system. Co-option is the rather clumsy, all purpose word for this complex process. Basically, it boils down to limiting political demands, and bringing their advocates into a sphere in which they will not be able to effect radical change. Then, they won't be able to threaten the system as a whole, but will believe that they are making a worthwhile difference, and so refrain from trying for more. Sometimes this is done by isolating the issue, or the people at stake. And this can be where it gets tricky – because you can make a real difference to some people, or on a particular issue, without challenging the system. But the question here is how come people are so often unable to do both. How come direct support is very often divorced from the politics of fundamental change? One other major way it can be achieved is by essentially bribing groups and organisations with funding, which is then, and often very subtly, made conditional on meeting particular, often political requirements. Applying for funding also saps organisations' time and energy, as well as pitting groups against each other, which can encourage a culture of division and competition rather than cooperation and solidarity. Crucially, it creates a culture of dependency on funding – once a group feels it can rely on funding it is very difficult to avoid creating structures which depend upon it. This means that if and when that funding dries up – or is denied due to the political nature of the work, or to funders' changing priorities etc – the group is no longer able to be as effective as it was before it received funding, because it is now set up to function with funding. It also means that it is more tempting to go through whatever hoops are required, including dilution of politics, to chase that funding. Of course it is also always worth remembering where the money is coming from and why it is coming. What are the funding organisations getting from funding a radical group – is it window dressing? Or subversion? Generally, wealth and power is not interested in redistributing that wealth and power so it is essential to be vigilant. With resistance which remains radical and aimed at systemic change, and with the potential to really disrupt the system however, repression is often the only option for those in power. The crucial thing here is how this is squared, or attempted to be squared, with the myth that capitalism is democratic. It comes down to ideological hegemony. What I mean by this is that there are firm limits on what is 'permissible' to say while remaining credible and 'mainstream'. One of these red lines is drawn along the belief that capitalism is or can be democratic – going against this norm – this 'common-sense' - often elicits ridicule, incomprehension, even disgust in modern, capitalist societies. When these 'heretical' opinions are translated into actions which oppose capitalist interests – for instance an anti-capitalist protest which threatens to disrupt some element of the operations of capitalism – their supposed illegitimacy is used to justify the repression they receive. While this shows the role of the state to protect corporate, capitalist interests, it does so while proclaiming to protect the public and society. This is because it seen as beyond the pale to question the supposed union between public and corporate interests. For a capitalist democracy, the two are equated with one another - economic growth is for the public good - and therefore to threaten one is to counter the other, to be anti-democratic, violent, anti-social etc. This is the point about made forcefully by Dave Whyte in the book – the union between the 'interests of the market' (as if personified) and the public. He termed this process 'market patriotism' i.e. how we are expected to see economic growth as a good, in and of itself, not because of what it will apparently provide us. (5) How is democratic capitalism able to present itself as genuinely democratic? Largely through the fact of having elections, no matter how stage-managed and controlled they are. In addition, by ensuring that some – albeit a carefully selected group – of organisations, NGOs and campaign groups can pressure these 'democratically-elected' politicians on a carefully selected collection of non-systemic issues – e.g. through carefully managed demonstrations and lobbying, petitions etc. Thus 'democratic' capitalism can say it allows for freedom to dissent. There is of course also the much-vaulted freedom of the press – but as the book shows this freedom is curtailed by corporate and/or state ownership of media outlets and ideological hegemony – that is by the tacit agreement to remain within particular parameters of 'legitimate', 'common-sense' discourse. This translates into a mainstream media which largely refuses to ask the fundamental questions about capitalism, and the kind of democracy we have, and in which more radical views which overstep those parameters are mostly marginalised or silenced. So in this way democratic capitalism can claim to have the procedural elements of a democracy – elections, freedom to protest, freedom of expression – even though none of these translate into popular participation in decision-making. (6) When did liberal democracy first emerge, and why? I argue in the book that liberal democracy emerged out of the contradictions of capitalism – that in fact the evolution of the two systems is interconnected. Capitalism emerged as a way to continue the extraction of capital in face of the stagnating feudal economy, and rising labour power which demanded higher wages and improved conditions. Liberal democracy emerged as a way to ensure sufficient acquiescence to that exploitative system. The real problem of social control arose since capitalism could not comfortably co-exist with the legitimating ideology of the feudal social order – i.e. the divine social order, in which everyone was born with a specific position in society. This did not allow the emerging merchant classes to begin new ventures to expand capital accumulation. So instead, the Enlightenment period saw the evolution of the social contract – and liberalism – under which all citizens were supposedly born free and equal. This freed up those merchants. However, leaving aside for a moment the millions of non-citizens in Europe and around the world who were brutally subjugated, this new freedom could hardly encompass the majority of citizens in the Enlightenment centres. Liberal democracy became the formal political mechanism behind this new doctrine of liberalism. However its freedoms – including voting – were strictly limited to only the wealthiest men. Those who had little to gain from capitalism – such women, and the workers – were deemed to be too much of a threat to the system, out of which they did so badly, to be given the vote. Suffrage was granted in increments – following popular struggles, and only to those whose material and political integration into the capitalist system rendered them relatively unlikely to pressure for systemic change (crucially via the enrichment of the growing middle class through imperialism). Eventually, in countries in the centre this could be expanded to near universal suffrage, though of course only in conjunction with other mechanisms of social control. (7) What are some of the other mechanisms capitalism uses to contain the social discontent and rebellion that it produces, besides the mechanism of liberal democracy? Overt force is ever present of course - repression at protests, detention of migrants, the penal system, military invasions etc. Other coercive mechanisms can be more subtle – such as debt or financial conditionality imposed by institutions such as the IMF and the World Bank. Another important mechanism is the constant pressure to consume – being taught to believe that what we have is never enough – we must keep up with the changing fashions, trends, and gizmos. This both keeps us buying things, a protection against over-production. and identifying in our purchases, less than in our selves and our relationships, so that we have less time and motivation for political activity, and more inclination to believe in the corporation – and by extension capitalism - as a moral force for good. Education of course is another important mechanism of social control – one which we often forget. It is interesting to note that when universal education was first enforced in certain American states it was fiercely resisted – by the communities who were fearful of the state indoctrinating their children, and protective of their rights to bring them up as they wished. (8) Is liberal democracy currently undergoing a crisis of legitimacy? What about capitalism? I'm not sure. I mean I don't know precisely what level of protest or opposition constitutes a crisis of legitimacy? It feels slightly ludicrous to make this kind of pronouncement. What I do think is important though is to have a sense of crises which isn't strictly linear or clear cut. What I mean is that while it appears now as though the capitalist and liberal democratic systems are more stable than a few years ago,( when the shock of the financial crisis was at its peak), this doesn't mean all is rosy now. The bottom line is that the system of democratic capitalism is and always will be precarious – so dependent is it on a contradiction and a lie. Moreover, the planetary limits, if not the human ones, will at some point have to put pay to constant capitalist expansion, though it might do so in the form of an ecological collapse. To avoid this, we must insist on the incompatibility of democracy and capitalism – and on the need to build the former at the expense of the latter. Both liberal democracy and capitalism are remarkably resilient – so this will be no easy task. (9) What kind of a relationship do imperialism and democracy have? Quite a complicated one. Initially, liberal democracy was reserved for the centre, imperialising countries, since it was only there in which certain sections of the population were sufficiently integrated into the capitalist system to be trusted with its rewards – I.e varying degrees of political power. The European colonial powers ruled their colonies via a combination of brutal force and co-option of existing power structures. Until forced, by decolonisation, there was never much thought of imposing democracy on them. The US version of imperialism differed however – based on more indirect power, rather than direct colonialism, the US usually began their imperial missions with a rhetoric of bringing democracy to the unenlightened masses who needed their tutelage. This is now the model used to justify most imperial ventures – since direct colonialism is no longer tenable following de-colonial wars. But obviously there remains a tension between imperialism and the control it requires – since democracy which supposedly implies the country in question's independence. How this tension is managed varies – but often it is done using the same 'tutelage' model. For example, post-invasion Iraq apparently needed external intervention and reconstruction to become democratic. And of course before that they needed a violent, military invasion, and now the violence is being escalated once again. Other tensions are created in the decidedly non-democratic regimes which are supported and propped up because they are useful – for instance in supplying access to oil fields and/or military bases – for the capitalistic system, with the US at the helm. These tensions correspond closely to the tension inherent in the incompatibility between capitalism and democracy: democracy must be curtailed and managed – it certainly cannot be left to the people to run - at least not until those people have been selected and taught how to be 'democratic', crucially via 'democracy promotion' programmes. (10) What is 'democracy promotion'? Why was it created? So 'democracy promotion' is the term given to overt methods of political intervention which effect indirect imperialism. So what used to be, and often still is, attempted via invasions, establishing client regimes and the co-option of elites is now also attempted via training civil society formations in the formal, procedural mechanics of liberal democracy. The aim behind this essentially co-option of civil society, and by extension hopefully public opinion, is to ensure that political resistance is channelled into forms which remain compatible with transnational capitalism. It functions as a way for governments (primarily the US but also the British, Canadian, Australian, German governments) to intervene and try to mould the political formations emerging in areas where the rule of neoliberal capitalism is not yet firmly established or entirely stable. The 'democracy' being promoted is very like the liberal democracy we have been discussing – in that it limits participation to voting between largely similar parties, largely aligned with the demands of neoliberal capitalism, and in which 'legitimate' public discourse usually refrains from voicing these limitations. While of course claiming to engender a free, open and inclusive political system. In short it comprises of the attempts to construct political structures which organise popular consent for transnational, neoliberal capitalism, protecting it from political instability. It includes training for political parties, NGOs, churches, trades unions, social movements. Democracy promotion has proved extremely effective in suppressing more organic, autonomous and liberatory popular politics, and containing resistance to the capitalist system, often in places where the placatory 'rewards' of that system are thinly distributed. Of course, imperialist political intervention and manipulation is nothing new. The important change signified by this trend towards using 'democracy promotion' is that its aims are very similar to more direct forms of political intervention such as colonialism, invasions, covert missions, or coup d'etats. Instead of imposing political structures 'from above', this more sophisticated technique moulds them 'from below'. And being conducted in the name of 'democracy' ensures that they do not court the same controversy as the previous covert manipulations. (11) Do you agree with David Cromwell that the “notion that we live in a proper democracy is a dangerous illusion”? Yes, this is the main crux of the book in fact. That this belief that capitalism is or can be democratic is key to sustaining the current system, and causing such suffering and ecological devastation. Not only are wars justified in its name, but it is a key reason why there exists such general popular consent for capitalism. It operates like a valve, out of which resistance and anger can be released, without much substantial political effect. Without it there would be more of a risk that the anger would boil over and threaten capitalist operations – that people would refuse to consent or co-operate. As it is, the belief that we can intervene in the political decisions made by political elites and corporations is an important reason why we don't rebel against the system in bigger numbers, why it's hard to organise for this. (12) Do you think that voting is pointless? Yes, sort of. But really it's about being aware of what purpose it serves, and what you may get out of it. The danger comes when you believe, or imply, that the liberal democratic system could, eventually, produce a system of rule that would be egalitarian and liberationary. I have very little time for arguments based upon 'effecting change from within' since it always seems like the forces against such change are more powerful than you, especially when you are so close, and so many compromises are required of you to remain so close, compromises which dilute and mutate your original political agenda. The real issue is that engaging in the liberal democratic system involves accepting at least some of its founding principles, which were constructed in order to placate and contain political dissent, rather than give power to it – such as representation, elections, the separation of economic and political spheres. Hence why it's important to try and understand the development of liberal democracy in tandem with capitalism – to understand how interconnected they are, and that to defeat capitalism we can't use liberal democracy. (13) What texts would you recommend to people interested in learning more about the paradox of democratic capitalism? For a particularly insightful take on the historical development of capitalism (and especially its relationship with sexism and patriarchy) I'd strongly recommend Silvia Federici's Caliban and the Witch, which can be downloaded for free here: https://libcom.org/library/caliban-witch-silvia-federici. And of course the book's analysis is heavily indebted to the analysis of the mainstream media by Noam Chomsky and Edward Herman, in their seminal Manufacturing Consent. For more contemporary and UK-based analysis of the media I'd recommend anything written by MediaLens. And then for those wishing to know more theoretical underpinnings of hegemony and consent of course there's Antonio Gramsci – upon whose thinking so much of the book is based. (14) What is Corporate Watch? And forgive the appeal, but Corporate Watch needs our readers' support to keep going – please donate if you can: http://www.corporatewatch.org.uk/pages/support-corporate-watch. Regular donors of more than £5 a month will receive all our publications for free as they come out! This interview was conducted by Richard Capes for the site 'More Thought' and completed on 15th October 2014.